On September 13, over 3,000 striking hotel workers and their supporters marched through downtown Chicago, in an escalation of their citywide fight for living wages, adequate staffing, and year-round health care. The strike, which began September 7, is the first-ever citywide strike for the hotel workers’ union, UNITE HERE Local 1. Central to the workers’ demands is fixing a system where some workers, who are laid off seasonally because of reduced business at the hotels, are left without health coverage for two or three months out of the year, or sometimes longer. Workers are also standing up against unsustainably burdensome workloads that have repeatedly led to injuries on the job. At the mass rally on the 13th, with intermittent chants of “shut it down,” the workers made it clear that they were prepared to fight to win their demands. On Thursday, union leaders announced a settlement with Hotel Blake and the Marriott chain, which together make up seven of the 26 hotels targeted by the strike. This agreement, approved by the membership, brought the strike to an end at those locations, bringing the total number of picketed hotels down to 19. The details of the agreement are still unpublished, but strikers told Socialist Alternative that they had won their primary demand of year-round health care for full-time employees, with no cuts in other benefits. Union members on the picket line are optimistic that the Marriott agreement can serve as a strong baseline for quickly negotiating settlements at the remaining hotels. The union must maintain maximum pressure until a contract is in place at every one of the 26 hotels. Only the continued threat of increasingly militant action can win the strongest possible contract. 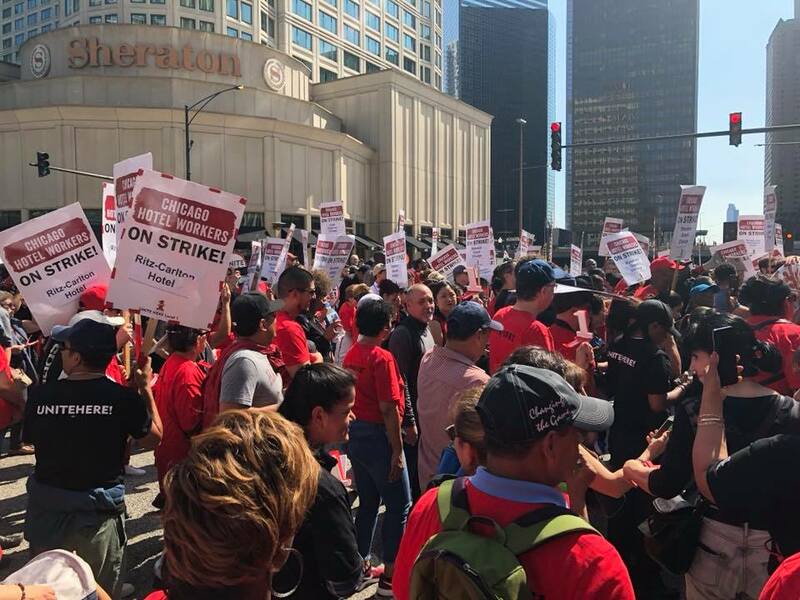 The scale of the Chicago strike has taken on additional importance, as thousands of hotel workers across the country have authorized strikes in recent days, including in San Francisco, Seattle, Hawaii, Boston, and Detroit! These workers will be looking to the experience in Chicago for inspiration and guidance. With hotel management scrambling to cover the work of 6,000 striking workers, this strike is demonstrating the powerful position that working people occupy in the economy. As in all industries, workers are what make hotels run smoothly and generate all the industry’s value, but that wealth is hoarded by billionaire owners and investors in the form of profits. In 2017, hotel industry profits increased for the eighth year in a row, to $77 billion – while the workers who make those profits have been forced to survive on low wages, unreliable health care, and the uncertainty of seasonal work. Shortly after the strike began, reports emerged of chaos inside the hotels, as management struggled to clean dirty bathtubs and process long check-in lines. The timing of the strike coincides with convention season in Chicago, when hundreds of thousands of convention-goers flood into the city and many hotels are operating at capacity. Workers make the economy run. Because of this, we have the power to shut down entire industries and win bold demands. Chicago hotel workers are pointing us in the right direction. Major contract struggles in 2018, like the wave of teachers’ strikes kicked off in West Virginia, demonstrate that working people can win major victories through mass action and a determined fight-back, especially when joined in solidarity by the rest of their community. These struggles are most effective when workers act as a united force. In West Virginia, teachers struck in all 55 counties and refused to go back to work, even at the behest of their union leaders, until the state passed raises for all public sector workers. The citywide nature of the hotel strike has likewise been critical to its success. It has united hotel workers across Chicago and given their struggle a high public profile. The historic action has been bolstered by demonstrations of solidarity from other union members. Union electricians and painters have refused to cross the picket line, while many Chicago UPS workers are refusing to deliver packages to the picketed hotels. At some locations, management has reportedly been forced to transport and restock hotel food supplies themselves, after union truck drivers refused the deliveries. This sort of unity among workers scares the billionaires who run our economy. As the strike enters its third week at 19 hotels, the union should be bold in calling for solidarity and participation from other unions and community organizations, as well as working people more broadly. Workers and the community should be ready to escalate the struggle if necessary. This could include mass picketing at any hotel that refuses to match the contract terms agreed by the Marriott. This sort of decisive and militant action could secure an overall victory for the strike and set an important example as thousands of hotel workers threaten similar strikes nationwide. In 2015, UNITE HERE endorsed and supported Mayor Rahm Emanuel in his re-election battle against a more progressive and pro-union challenger. The union’s support – notable in a year when major public and service sector unions were pushing for an alternative – was critical in pushing Emanuel over the finish line. Despite this, Emanuel remained silent during the strike until after the Marriott deal had been signed. A quick look at his financial history explains why: as reported by the Sun-Times, Emanuel accepted a $10,000 donation from the Illinois Hotel-Motel PAC just weeks before the strike began. This followed a $25,000 donation from the same employer PAC in June. The Illinois Democratic Party also selected JB Pritzker, a billionaire whose family owns Hyatt, one of the targets of the strike, as their candidate for governor. Unsurprisingly, Pritzker has remained similarly silent about the strike. Through their silence, the leaders of the Democratic Party have made their allegiance clear: they are happy to accept checks from unions but fail to support working people in their fights with big business to improve their lives. Working people need their own political party that will stand in solidarity with them, both in office and in the streets. Instead of filling the campaign chests of Democrats, union money and backing could be the spine of a new, independent political party in Chicago, Illinois, and nationally. With the establishment regrouping after Emanuel’s withdrawal from the 2019 mayoral race, UNITE HERE could use the momentum coming off this strike and join other major unions in the city to recruit and support an independent, pro-worker candidate for mayor. In an atmosphere of widespread disgust for Chicago’s crooked and disarrayed Democratic machine, such a candidate could get massive support if they ran on a program including an immediate $15 minimum wage, taxing the rich to fund affordable housing, education and social services, and unwavering support for worker struggles. As the working class rediscovers the strike tactic, the hotel strike has demonstrated some of the lessons of history. UNITE HERE worked for years to get these contracts to end at the same time so negotiations and actions could happen simultaneously. This is crucial for developing working class strength in a strike. Socialist Alternative will be on the picket lines supporting this strike and calls on everyone to join the strikers in Chicago!